Epidermoid cysts are rare, slow-growing, benign, and developmental cysts that are derived from abnormally situated ectodermal tissue. Epidermoid cysts may grow anywhere on the body and about 7% of them are located in the head and neck. 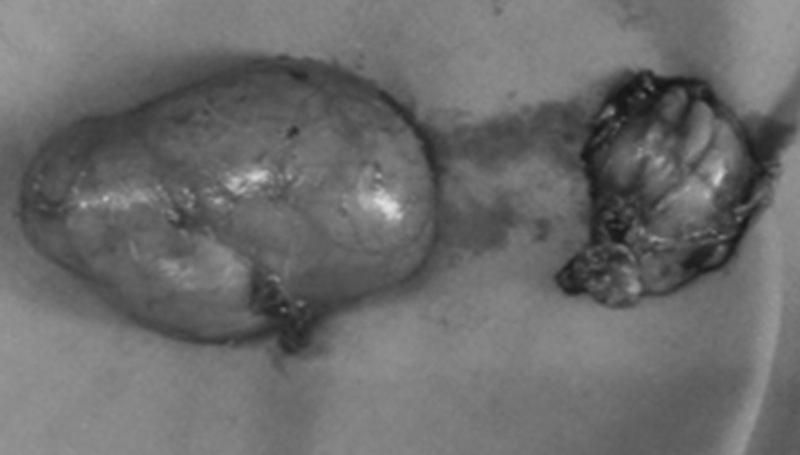 These cysts arise from traumatic implantation of epithelium or entrapment of epithelial remnants during embryonic fusion. Histopathologically, they are lined by stratified squamous epithelium and lumen without any skin appendages. Here, we present a case of large epidermoid cyst occurring in submandibular region. Epidermoid cysts may grow anywhere on the body and about 7% of them are located in the head and neck, with the oral cavity accounting for only 1.6%. Intraorally, it is a benign slow growing and painless entity, which is usually located in the submandibular, sublingual, and submental region. ,, They can cause symptoms of dysphagia and dyspnea. Epidermoid cysts can occur at any age from birth to 72 years; they usually become apparent in patients between 15 and 35 years. Males are more commonly affected and may present as small or large masses. Epidermoid cysts are benign pathologies that can occur anywhere in the body, predominantly seen in areas where embryonic elements fuse together. Most cases have been reported in the ovaries and the testicles (80%), with head and neck accounting for 7%. Dermoid and epidermoid cysts in the mouth are uncommon and comprise <0.01% of all the oral cysts. A 22-year-old female patient reported to the clinic with a mild swelling on the left side of face. The swelling was diffuse, and of 6 months duration. It initially started as a small swelling, which gradually increased to present size. Patient had no history of pain in this mass. His past medical and dental history was not relevant too. On examination, extra orally swelling was present on the left submandibular region. The swelling was oval in shape, 2 cm × 3 cm in dimension. No symptoms of pain and tenderness over the swelling seen. The swelling was freely movable and was not attached to the underlying tissues. Overlying skin was normal in color, texture and was pinchable. Fine-needle aspiration cytology of the lesion was done and the smear stained with hematoxylin and eosin revealed mucin and keratin, which was very non-specific. An enucleation of cyst was done under GA through submandibular approach along with removal of involved submandibular gland. The specimen received was yellowish in color; it was a soft tissue mass, with 6 cm × 5 cm × 4 cm in dimension. On palpation it had dough like consistency. On grossing, it had a thin walled capsule surrounding, with a cheesy white material inside. Smears were made with the cheesy material and stained with H and E. It revealed few squamous cells with mild hyperchromatic nuclei. Histopathology of the specimen revealed cystic lining lined by stratified squamous epithelium and connective tissue showed keratin and adipose tissue suggestive of epidermoid cyst [Figure 1], [Figure 2] ,[Figure 3], [Figure 4], [Figure 5], [Figure 6], [Figure 7]. The epidermoid cyst, often mistakenly called a sebaceous cyst or wen, is a very common skin lesion which arises from traumatic entrapment of surface epithelium (epidermal inclusion cyst) or, more often, from aberrant healing of the infundibular epithelium during an episode of follicular inflammation or folliculitis. Oral and pharyngeal epidermoid cysts of the inclusion cyst variety also occur, but are rare in adults and are frequently so small that they are not biopsied. Syndromes associated with multiple cutaneous epidermoid cysts, such as Gardner syndrome, Gorlin syndrome and pachyonychia congenita, do not demonstrate cysts of the oral mucosa, but facial cysts may occur. Epidemiologic investigation has determined a prevalence rate of 1 cyst/2000 adults. The epidermoid cyst of the oral floor midline has a much greater growth potential than epidermoid cysts occurring at other oral/pharyngeal sites. These large cysts are often given the label dermoid cyst by authorities who believe it to be a forme fruste of benign, cystic teratoma. Since its first description in 1852 as a sublingual cyst or wen, the distinction between the oral floor epidermoid and dermoid cyst has been rather confused. As it is likely that most examples represent cystic degeneration of embryonically entrapped epidermis, and as the microscopic features of this cyst are almost always identical to those of the epidermoid cyst of the skin or other oral locations, literatures suggests that the use of the term dermoid cyst be reserved only for those cysts with epidermal adnexa beneath the lining epithelium. Congenital teratoid cyst contains elements derived from all three germ layers, ectoderm, mesoderm, and endoderm. Epidermoid cysts may be categorized as congenital or acquired based on their origin, although there is no disparity between the two either clinically or histologically. They may be found in any age group, but show preponderance between 15 and 35 years of age with male predilection. , Although, floor of the mouth in the midline is most favored site, occasional occurrence involving the buccal mucosa, tongue, lips, uvula, temporomandibular joint dermal graft, intradiploic, intracranial, and intraosseous location within the mandible and maxilla also have been reported in literature. Due to these sublingual swellings in the floor of the mouth symptoms of dysphagia, dyspnea and dysphonia may occur due to upward displacement of tongue. Epidermoid cysts typically feel "dough like" on palpation, although they may be fluctuant and cyst like based on consistency of the luminal contents that may range from a cheesy, sebaceous to liquefied substance. The difficulties involved in the clinical diagnosis of infected dermoid or epidermoid cysts is that they may be mistaken for ondontogenous abscesses, infected atheromas, furuncles, superinfected tumors, and specific inflammations. The differential diagnosis for sublingual dermoids comprise ranula, unilateral or bilateral blockage of Wharton's ducts, lipoma, thyroglossal duct cyst, cystic hygroma, branchial cleft cysts, acute infection or cellulitis of the floor of the mouth, infections of submaxillary and sublingual salivary glands, floor of the mouth and adjacent salivary glands benign and malignant tumors, heterotopic gastrointestinal cyst and duplication foregut cyst. Histologically, the epidermoid cyst is lined by a thin stratified squamous epithelium with few rete processes. Quite often, there is no granular cell layer and keratin from the surface of the epithelium can be seen to be sloughing into the cystic lumen, which is usually filled with degenerated and necrotic keratinaceous detritus. Areas of epithelial degeneration or ulceration may be seen, usually associated with a mild to moderately intense chronic inflammatory cell reaction. Inflammation may extend deeply into subepithelial fibrovascular stroma. Occasional cysts have contained fungi, bacteria or necrotic food debris in their lumina, and darkly hematoxylophilic precipitated salts (dystrophic calcification) may be seen within the necrosed keratin. Epidermal cysts that do not cause functional or cosmetic problems are normally not treated. When a cyst is ruptured, infected or inflamed, injections corticosteroid or incision and drainage have been attempted. 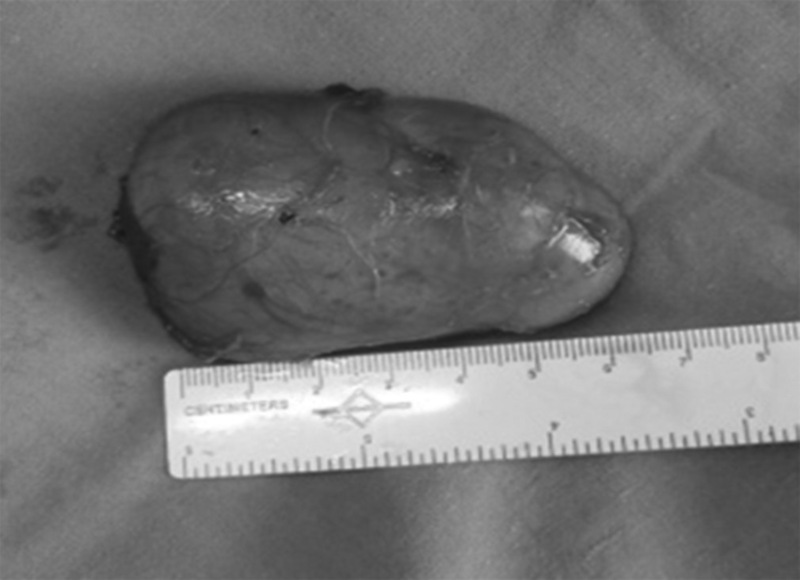 Surgical excision appears to be the mainstay of treatment; however, the extent of removal is dictated by adherence of the tumor capsule to the surrounding vital structures. It comprises total surgical excision without any rupture because spillage of the cystic contents to the underlying fibrovascular structures can cause postoperative inflammation. In cases where pus and blood are excreted, hydrogen peroxide gel can be used to dry out the cyst. Rate of malignant transformation to squamous carcinoma and basal cell carcinoma are rare; however, a 5% rate of malignant transformation of the teratoid variety of oral epidermoid cysts has also been quoted in literature. ,, Recurrences of these cysts are very rare. Epdermoid cysts of head and neck origin are quite a rare entity. Here, we report as case of epidermoid cyst, which clinically appeared as a lipoma/rannula, later turned out to be epidermoid cyst. 1. Shafer WG, Hine MK, Levy BM. A Text Book of Oral Pathology. 4 th ed. Philadelphia: WB Saunders; 1993. 2. Koca H, Seckin T, Sipahi A, Kazanc A. Epidermoid cyst in the floor of the mouth: Report of a case. Quintessence Int 2007;38:473-7. 3. Ozan F, Polat HB, Ay S, Goze F. Epidermoid cyst of the buccal mucosa: A case report. J Contemp Dent Pract 2007;8:90-6. 4. 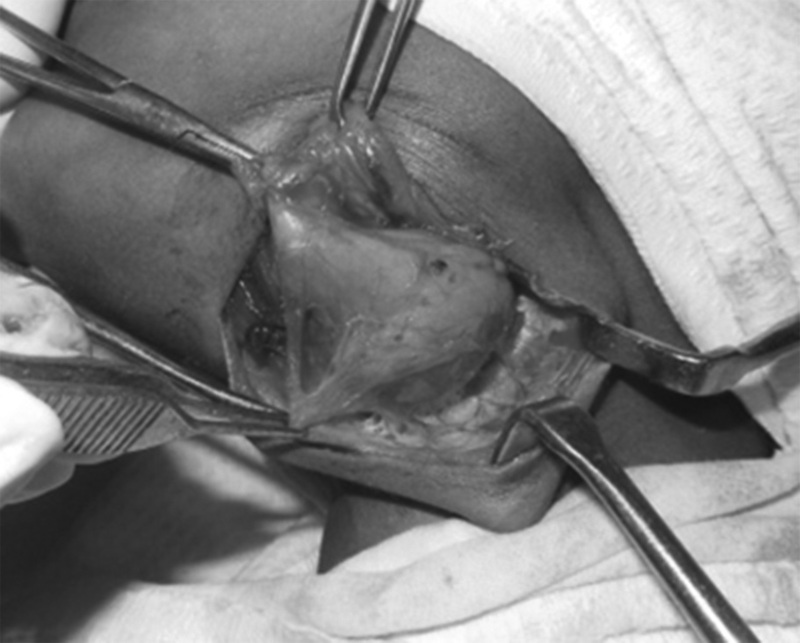 Pancholi A, Raniga S, Vohra PA, Vaidya V. Midline submental epidermoid cyst: A rare case. Internet J Otorhinolaryngol 2006;2:74-77. 5. Kandogan T, Koç M, Vardar E, Selek E, Sezgin O. Sublingual epidermoid cyst: A case report. J Med Case Rep 2007;1:87. 6. Damle MV, Irani DK, Hiranandani NL. Epidermoid cyst of the floor of the mouth. Case report. Bombay Hosp J 2002;44:267-70 . 7. Hemaraju N, Nanda SK, Medikeri SB. Sub-lingual dermoid cyst. 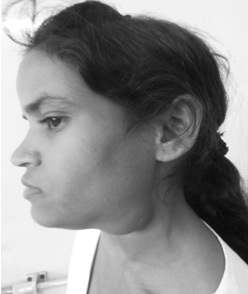 Indian J Otolaryngol Head Neck Surg 2004;56:218-20. 8. Shear M, Speight P. Cysts of Oral and Maxillofacial Region. 4 th ed. [Copenhagen, Denmark]Blackwell Munksgaard; 2007. p. 181-83. 9. Rutherford SA, Leach PA, King AT (2006). Skull Base: An Interdisciplinary Approach. 2:109-15. 10. Mustafa Tuz, Harun Dogru, Kemal Uygur (2003). Rapidly growing sublingual dermoid cyst throughout pregnancy. Am J Otolaryngol 24: 334-37.